As much as I admire Pauline Kael’s approach of only seeing a film once, insofar as it forces the reviewer to come to firm opinion and yields an exciting immediacy. There is something to be said for the second viewing of a film. The reviewer has a fixed impression of the picture in question as well as the images and moments that have struck him. What is left are those, little moments, possible reconciliation and clarifications as only the second viewing can provide. Watching Mad Max: Fury Road again proved to be revelatory. What had immediately struck me was that some previously harrowing scenes played more comically. 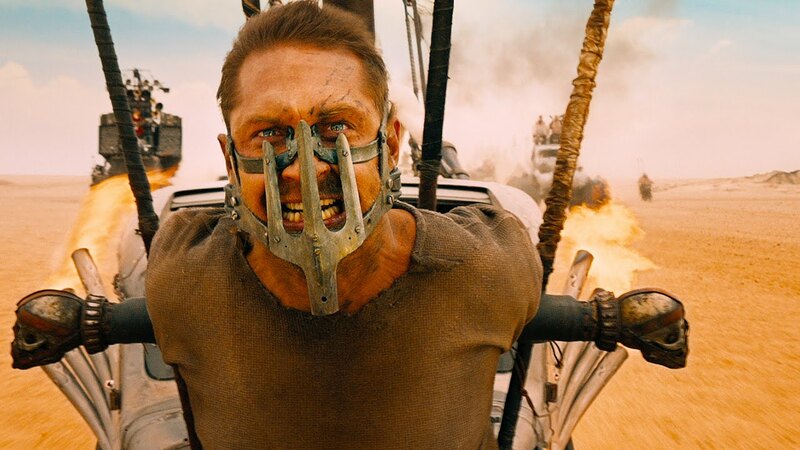 For example, the scenes where Max was strapped to the front of Nux’s car played like comedy from the silent era. Director George Miller goes so far to evoke this by intentionally speeding up the footage, which results in some amusing moments of unnatural movement. In fact, if one were to ignore the overt harrowing portrait of how people have become dehumanised and a means of flittering out resources. Then the first half of Fury Road would play like absurdist and a farcical piece that depicts a man’s unlucky woes as he attempts to escape at the hands of his mad capped captors. The comedic edge of the film extends to other parts of the film. Miller has always filled his previous Mad Max directorial efforts with strange and quirky peripheral characters and that is no different here. There is one character who is a brother of the primary antagonist, Immoten Joe who looks like a political cartoonist interpretation of a banker. And his dialogue even aligns with this conception, which is shown when he talks about assets and prices in regards to the primary goal. There are even nice little amusing moments when some of the gang members comment upon Joe’s plan, one encapsulates it as a pointless family squabble. Finally, the most impressive aspect of Fury Road is in its editing. In the Trailers From Hell video on the picture, the Australian director, Brian Trenchard-Smith revealed that George Miller had shot over 480 hours of footage. The continuous playback of this would add up to three weeks of film. It is commendable that Miller was able to distill all this into a coherent and purely visual two hour film. Pauline Kael famously remarked on the nature of films that “When you clean them up, when you make movies respectable, you kill them. The wellspring of their art, their greatness, is in not being respectable.” Fury Road is a pure vision that thankfully has not been censored or made to answer for its maddening existence.